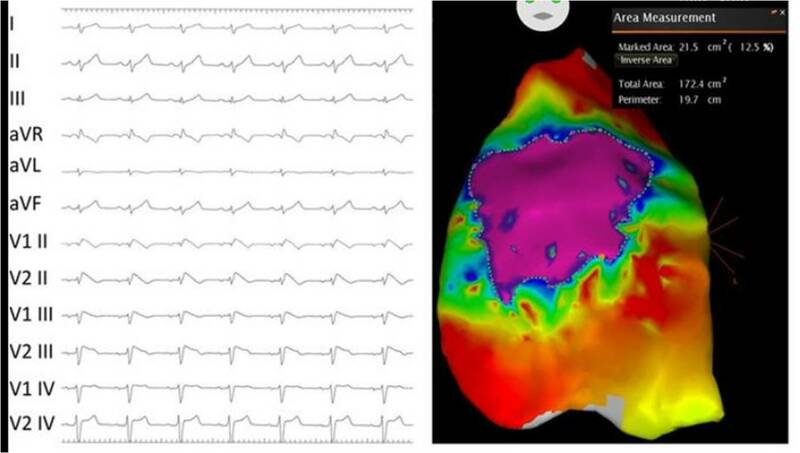 More direct evidence for “Brugada syndrome” to be called as a structural heart disease ! Brugada syndrome is as an Inherited sodium Ion channel defect leading to loss of /or reduced sodium channel function.This specifically causes RV epicardial Imbalance of In-flowing(depolarising) and out-flowing (repolarising)current , potentially triggering ventricular arrhythmia. This happens either spontaneously or during electrical stress times which include, fever, various drugs , adverse autonomic fluxes etc. So far, we have been thinking it as primary electrical disorder with no macroscopic/ histopathologic defects. But, how is this primary electrical disease , harbor a well demarcated RV epicardial phenotypic substrate ? . . . ablation of which eliminates the VT. Still , Brugada is more of a electrical disorder, but soon we may refer it as structural heart disease. 6. Morimoto S, Uemura A, Watanabe E, et al. A multicentre histological study of autopsied and biopsied specimens in Brugada syndrome. Eur Heart J 2003; 24(Suppl): 147. Is Brugada syndrome, a structural heart disease ? Brugada syndrome is probably the most fascinating discovery in Inherited cardiac Ion channel dysfunction that linked the basic sciences to bedside . Its due to genetic defect in SCN gene that results in sodium channel blockade of phase of action potential to cause troublesome ventricular tachycardia (Phase 2 reentry ) . Now we realise, there are some phenotypic expressions to this gene defect . RV epicardial anatomical substrates are found to responsible for these Arrhythmias. 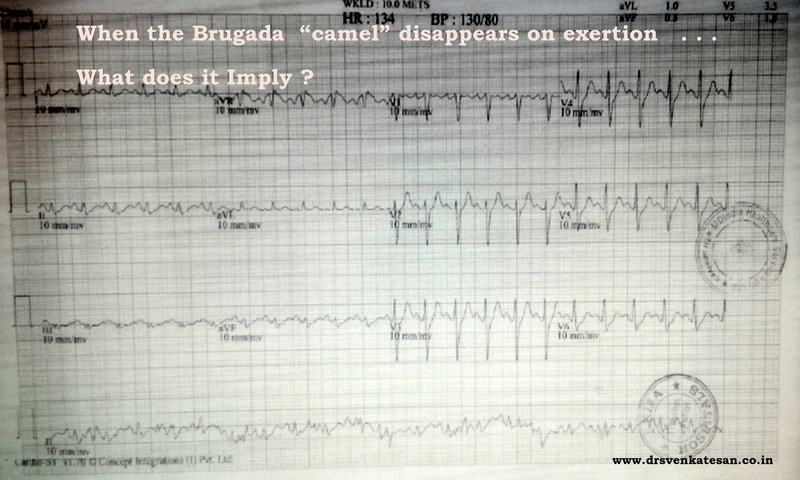 So ,does Brugada turn out to be a structural heart disease (At least histological ) ? Where is the evidence coming from ? Now, we realise RF ablation of epicardial aspect of RVOT / Adjacent anterior RV wall can eliminate Brugada pattern confirming anatomical defect at cellular level. Our changing perception of Brugada from pure functional to anatomical cause is exciting and intriguing as well ! ICDs were the specific therapy so far.This discovery make it RF ablation an option. We have been taught Brugada syndrome is a primary electrical disease .It was never considered as structural heart disease. Knowledge evolves slowly, so we shouldn’t conclude prematurely .Shall we conclude , Brugada syndrome is truly a structural heart disease at least in some ?*. This makes RF ablation a new cure for Brugada , making it a useful alternate modality to ICD , Of course there can be an overlap between ARVD and Brugada syndrome. Mind you RF ablation scores over ICD on any given day as its potential cure , while ICD is just a back up device and it simply wait & watch for the VT to occur.We also know ICDs are still learning human EP data, and are not intelligent enough to differentiate true VT from false ones with acceptable error** margin. **Acceptable ? What do you mean by that ? 1.Kofune M1, Watanabe I, Ohkubo K,Clarifying the arrhythmogenic substrate for Brugada syndrome.Int Heart J. 2011;52(5):290-4. 2.Nademanee K1, Veerakul G, Chandanamattha P, Prevention of ventricular fibrillation episodes in Brugada syndrome by catheter ablation over the anterior right ventricular outflow tract epicardium.Circulation. 2011 Mar 29;123(12):1270-9. 3.Pappone C, Brugada J, Vicedomini G, et al. Epicardial ablation in Brugada syndrome. Insights from a prospective registry study of 50 consecutive patients. European Heart Rhythm Association EUROPACE-CARDIOSTIM 2016; June 8, 2016; Nice, France. 1.Is Brugada VT monomorphic , polymorphic or both ? 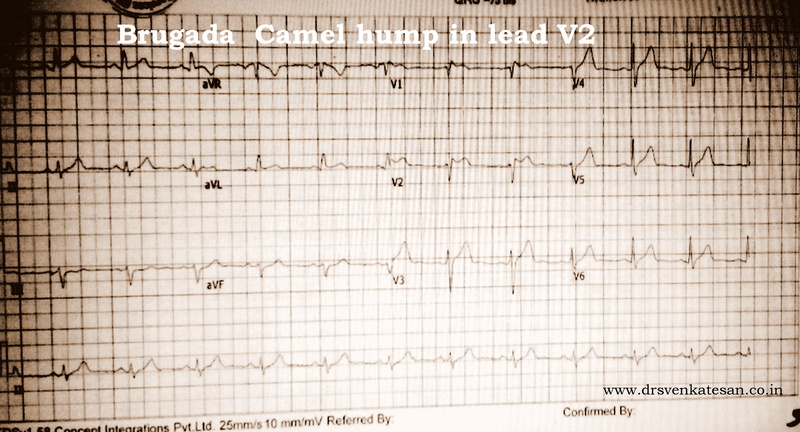 2.Is Amiodarone Indicated in Brugada syndrome ? It is not Brugada for sure , I am just suspecting it . . . what to do ? Have you felt like this query any time in your office ? If “Yes” is your answer, then you are not alone .There was a unique conference that took place in 2010 to answer the same query in Rome , Italy on behalf of Italian cardiology society , where this entity is researched more than any other place.Its worth going through this. 1.Doubts of the cardiologist regarding an electrocardiogram presenting QRS V1-V2 complexes with positive terminal wave and ST segment elevation. What is the effect of excercise stress test on Brugada syndrome ? Brugada syndrome has three distinct type of ECG pattern.ST segment in V1 to V3 shows the maximal changes .All manifest as subtle forms of ST elevation . Prompt normalization indicate correction of repolarization heterogeneity and suggest relative immunity for development of ventricular arrhythmia at fast rates. In contrary , new appearance or worsening of Brugada pattern would help us identify high risk subsets of Brugada. 1.Grimster A,Segal O,Behr E . Type I Brugada electrocardiogram pattern during the recovery phase of exercise testing. Europace 2008;10:897–8. 2.Amin A,De Groot A,Ruijter J,Wilde A,Tan H . Exercise-induced ECG changes in Brugada syndrome. Circ Arrhythm Electrophysiol 2009;2:531–9. ECG clues one should look for after reverting a VT ? Ventricular tachycardia is a common cardiac arrhythmia. The significance of which can be very dangerous to relatively benign depending upon the etiology and underlying heart disease . The ECG during VT is rarely useful to identify the etiology .Often times ECG after reversal will throw more light . What are the ECG clues one should look for once VT is reverted ? Tall T waves/ U waves / Inverted T -and other electrolytic abnormality. Delta waves would indicate anti-dromic tachycardia. Top 5 conditions that closely mimic and often mistaken for STEMI ! The repolarisation is due to K + efflux . The K channel porosity is subjected to high degree of genetic variations .If the repolarisation starts even by 10 milli- second earlier, it would have early take off from descending limb of R wave and the J point ST segment appear elevated. The ST elevation in ERS is often global . On EST it is expected to the touch the baseline . * STEMI in ERS : The issue becomes too delicate , if a patient with ERS develops a true ACS . ERS being a common ECG pattern in general population , it is not wise to label every chest pain in ERS patient as benign . Suspicious ones demand observation in step down units , at least ! “Any patient with LBBB & chest pain . . . suspect MI” . Every LBBB is new onset unless you have a documented proof otherwise . . . it seems to suggest ! Probably , this is the reason many of the LBBBs are thrombolysed when they present to ER in an acute fashion . Of course , we can apply criteria of Sgarbossa to differentiate ! however flimsy it may appear . It help us to exclude few benign LBBBs. Still , Sgarbossa will struggle to differentiate an acute STEMI in Chronic LBBB from an acute LBBB in old AWMI . Simply put . . . even old MIs are at risk of acute intervention if they have LBBB and vague chest pain ! How to overcome this ? Always rely on clinical features . If STEMI is causing the LBBB , it should be a large extensive one and you can not expect the patient to be comfortable . (Logic would suggest necrosis of large parts of IVS is necessary to cause LBBB ) Chronic LBBBs are relatively comfortable . Role of enzymes and Echocardiogram in LBBB and suspected STEMI . LVH with incomplete LBBB – A very common association that can further elevate ST segment in v1 to v3 . Left ventricular hypertrophy mimics old MI as poor R wave progression in V1 to V3. Contrary to our belief even Inferior leads can show q waves due to inferior septal hypertrophy. With aging population and rampant acute and chronic renal disorders it is becoming a daily affair to get calls from medical units for ECG changes .We know the rapidity of efflux potassium is responsible for ventricular re-polarisation .Phase 2, and 3 are K + exit zones. This is the same phase ST segment and T wave are inscribed.In hyperkalemia K + accumulates inside the cell and keep ST/T segment elevated .T wave also becomes tall . It can mimic both as hyper acute STEMI . Acute abdominal conditions mimicking inferior STEMI. Panic attacks /Anxiety states / chronic anti psychotic medications which are known to elevate ST segments. Break through in Brugada syndrome ! . . . always carry this vital data in FINGER tips ! Brugada syndrome continues to fascinate us for two reasons. While high risk subsets of Brugada are easily managed , it is the asymptomatic ones that bother us. The following are some of the difficult questions , a cardiologist faces when dealing with patients , who exhibit only Brugada pattern in ECG . Should I go for an EP study Doctor ? Will I require an ICD Doc ? Do I carry a significant risk of dying suddenly ? Do I need a genetic test for sodium channel mutation ? Fortunately, we can answer all these questions with much courage than before. “No” is the clear answer for all of them ! Summary from the FINGER registry. In the follow-up of 31.9 (14 to 54.4) months . A total of 7 death occurred .